Blend the Cheerios™ in a food processor until you have crumbs, but use the pulse setting so you have crumbs of different sizes. Place the cereal crumbs in a bowl, add the sugar and stir well. Add the butter and mix evenly. 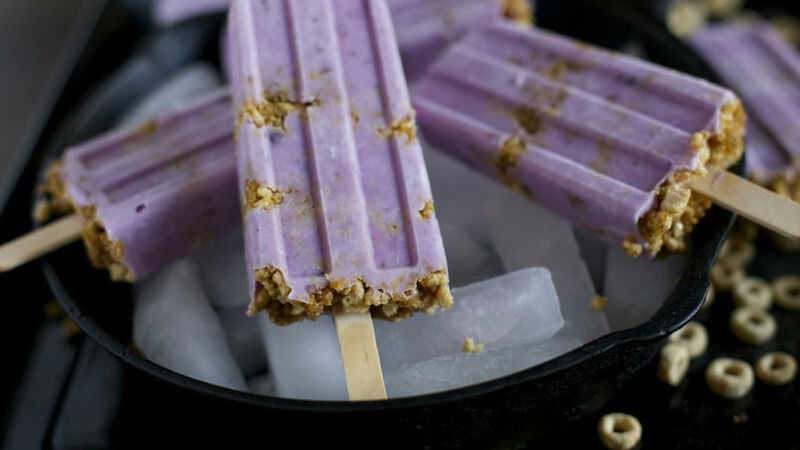 Create the paletas by alternating layers of yogurt and cereal crumbs. Finish with a layer of cereal crumbs. After adding each layer to the pop molds, tap the mold on the counter to let the layers compact. Remove from mold and serve right away. You can use any yogurt flavor. Don’t use sweeter varieties of Cheerios™ because the paletas will be too sweet. During the summer, the rules of my house are relaxed a bit and we will sometimes have snacks or eat dinner in front of the TV. One of the most popular desserts are these CheeriosTM and yogurt paletas; it’s like a pie on a stick.